You’re big when you’re known by your first name only. When I was little I really wished my name was Julie. I didn’t care if I was the mother or a baby in a game, just so long as my name was Julie. That’s when I was truly happiest. Let’s imagine now that I’m a singer. They’re reading out the nominations for the Grammy award for Album of the Year. Today’s prompt in Clairey Hewitt‘s I’m Blogging Every Day in May! is ‘First names’. Do you have any thoughts? I just know trying to choose 6 names when having 3 boys was really hard. I only ever really like Tom as a name so the next 5 were a little tough! Naming your children is really hard. We didn’t come up with Elsie until a day or two after she’d arrived, so we used to say to each other, “Should we go up and see the baby?” Naming her was one of the steps in feeling like that little thing in the humidicrib was really ours. Oh Larissa – you’ll make me cry!!! So true, when you are recognised by your first name on the international stage, I think you can say you have ‘made it’. Just curious why Julie speaks to you. Love the non album cover. I didn’t know any Julies back then, Matilda, I just thought it was the prettiest name I’d ever heard! I couldn’t agree more Julie 😉 Love the pic! And a very clever observation with the first name coolness. Thanks Emily, keep an eye out for an album full of clumsy strumming and out of tune singing. 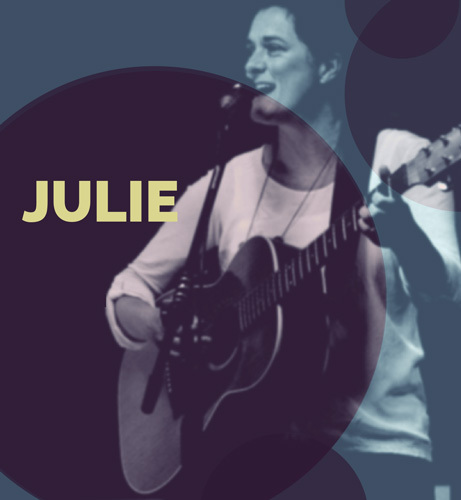 Great album cover…Julie…can you sing or is it only a childhood dream? Thanks Lisa. It’s a childhood dream. I can sing a few songs and I love it, but there’s a really large gap between where I’d like to be and where I am with music! Ha ha – I like Julie .